Its a little nerve racking when you are pointing a camera at someone. Just waiting for that shout ( Hey what are you doing) but no one seemed to notice !! so I think I will try it again. 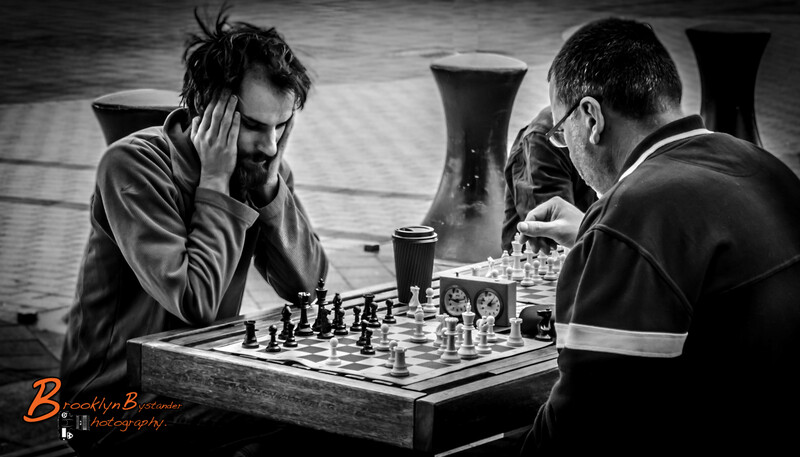 This entry was posted in Photography and tagged Adelaide, black & white, Chess, Lightroom, Photography, Port Adelaide, Street, Street Photography. Bookmark the permalink. Great shot, and very good that you are going out street shooting…look forward to seeing more. First attempt? Hard to believe! I can imagine that would be unnerving, but you really did a great job. Looking forward to the next one!! I think it’s brave as you never know what the reaction’s going to be. It’s a great shot as you’ve certainly captured ‘intense concentration’. I look forward to seeing more of your street photography. Thank you so much I will have try venture out again soon and see how I go, It is a bit scary though !! Very well done, you’ve captured the frustration or concentration of the player. Definitely, go for more. I agree with all thoughts above…..I have never done it and it makes me nervous just thinking about it. Can I ask, how far away from them were you? I too, look forward to more. I’m scared stiff of photographing strangers. Well done. I was to, still am sometimes. especially when they give you that evil look !! When people are focused in what they are doing, they won’t notice – or maybe they do but their brain will just ignore the distraction. And chess can be very absorbent! I invite you to visit my page dedicated to photos of chess players (which happens to be my speciality).